The Belle Isle Conservancy today announced that the William Davidson Foundation in Troy has awarded a three-year, $1.7 million grant to stabilize, restore, and modernize the Belle Isle Aquarium. A portion of the gift — $700,000 — has helped start facility engineering studies, repairs to critical infrastructure, and the development of plans to modernize the Aquarium in keeping with Association of Zoos and Aquariums accreditation standards. The remaining funds – $1 million – will be used as a one-to-one match to incentivize people who enjoy the Aquarium and want to contribute to its ongoing renovations and long-term sustainability. “The investment from the William Davidson Foundation is a huge milestone in the Belle Isle Conservancy’s journey to bring back the historic Belle Isle Aquarium to its former glory and to secure additional resources for our island jewel,” says Michele Hodges, president of the Belle Isle Conservancy. 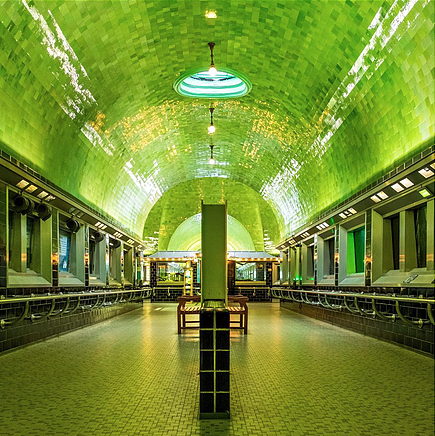 During the seven years the Albert Kahn-designed Belle Isle Aquarium was closed, a group of passionate volunteers fought to protect the facility from further damage and advocate for its reopening. The Belle Isle Conservancy reopened the Aquarium to the public in 2012. The William Davidson Foundation endorsed their efforts with its first major grant, made in 2014, for urgent repairs to the Aquarium, such as repairing the sidewalks and refurbishing the vintage ceiling tiles. “We’re thrilled with the support we’ve seen over the last six years to get the facility back up and running, renovate the vacant tanks, and staff the Aquarium with a professional team of aquarists and educators,” says Hodges. The William Davidson Foundation supports transformative efforts that enrich the quality of life for current and future residents and visitors to metro Detroit as part of its overall mission to advance the economic, cultural, and civic vitality of southeast Michigan, the state of Israel, and the Jewish community. “The Aquarium is an iconic and much beloved destination — one of many associated with the historic and beloved Belle Isle park,” says Darin McKeever, president and CEO of the William Davidson Foundation. “These kinds of destinations across southeast Michigan — we call them ‘signature spaces’ — help define and bind us together as a community. The announcement was made in advance of the Conservancy’s annual Polish the Jewel luncheon, which will be held tomorrow at the Detroit Yacht Club. Chaired by Sarah Earley and sponsored by DTE Energy, the luncheon is expected to raise nearly $200,000 toward the Belle Isle Beachfront Revitalization Project – a $4 million project with the goal of making improvements to the bathhouse, reconnecting the beach area, and adding a splash park to replace the demolished water slide feature. The state of Michigan’s Department of Natural Resources started managing the city-owned park in 2014. While the state of Michigan brings significant resources to the island, the amount of restoration and improvement needs across the 982-acre island far exceeds the DNR’s annual budget.